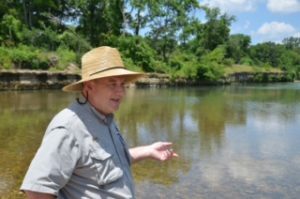 Compared to years ago, the Illinois River in eastern Oklahoma is cleaner these days, thanks to the work of Ed Fite and the Oklahoma Scenic Rivers Commission. As of Friday, the Commission will no longer exist and Fite will instead become an employee of the Grand River Dam Authority. Ron Hays at the Oklahoma Farm Report focused on Fite’s work on keeping the Illinois River clean.